Howard Kellogg suggested over on the Edutopia assessment forum that "While the "test" may represent the "bar" we have to clear, it is not the "bar" that must occupy our total attention." I think the analogy of clearing the bar is a good one for a number of reasons. Imagine you are back in school at a track meet (which by the way don’t happen anymore in a lot of schools because of budget cuts, safety issues, and a narrow focus on math and reading skills) and you have a high jump set up. The bar for the high jump is initially set so that every student has an opportunity to jump over the bar. Students who cannot jump, for whatever reason, do not participate. Over time, the bar is raised until only a few top students manage to make it over, and eventually a tie occurs, or there is a winner of the competition declared. Every child gets to experience some level of success, although for many children this success will still be a relative success as they will naturally compare their ability. 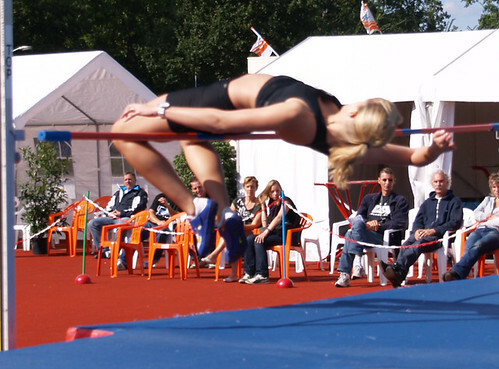 In many cases, students actually choose which events they will compete in, and so not every student will even try the high jump event, prefering to focus on events in which they feel more capable, or have more interest in. If the high jump was like how we run standardized tests, every child would be expected to be able to jump over the same bar and labelled a failure if they don’t succeed. For some children the bar would be set too low, and they would set lower expectations for themselves in the future. For other children the bar is set too high, and they will label themselves a failure. Many of them would not participate in future competitions simply by dropping out of the track and field event. For some children, the entire exercise would be ridiculous because they couldn’t possibly jump over the bar, no matter where we set it. Further, we would judge schools and teachers based on their ability to make kids jump over the bar, without concern about who they are working with. As an aside, some school districts (like NYC for example) would be using a special rubber bar that they can bend and flex to ensure that the "right" number of kids are able to pass it.